Posture check! 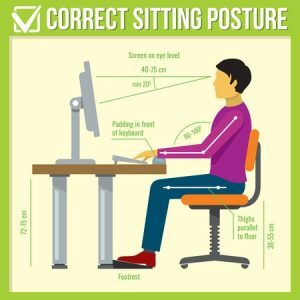 Are you slouching or hunching while reading this? 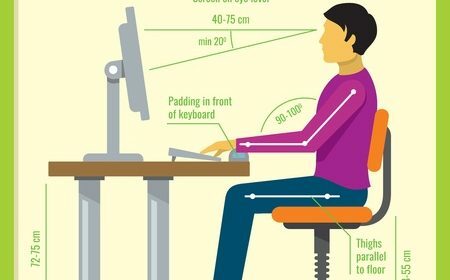 Here is a four-step checklist that you can carry out at your workstation, to make sure you’re comfortable, safe and productive at the office. Adjust the seat height so your feet are flat on the floor or on a foot rest. Your knees should be slightly lower than, your hips. Adjust the back of the chair to a 100°-110° reclined angle. Make sure your upper and lower back are supported. Use inflatable cushions or small pillows if necessary to create the correct lower back support. Tilt of the keyboard is dependent upon your sitting position. Use the keyboard tray mechanism, or keyboard feet, to adjust the tilt. A Wrist pad can help to maintain neutral postures and pad hard surfaces. However, the wrist pad should only be used to rest the palms of the hands between keystrokes. Place the mouse as close as possible to the keyboard. Incorrect positioning of the screen and paperwork can result in awkward postures. Adjust the screen and paperwork so that your neck is in a neutral, relaxed position. Sit at least an arm’s length away from the screen and then adjust the distance for your vision. Reduce glare by careful positioning of the screen. Position paperwork directly in front of you, between the screen and the keyboard, using an in-line copy stand. If there is insufficient space, place paperwork on a document holder positioned adjacent to the screen. Place your telephone within easy reach. Telephone stands can help. You can read more about stretching in our April 2016 post about the importance of stretching. Magnificent Information sharing .. I am remarkably energetic to investigate this article .. appreciative for giving us experience info.Fantastic beautiful.